Europa, a moon of Jupiter, appears as a thick crescent in this enhanced-color image from NASA's Galileo spacecraft, which has been orbiting Jupiter since 1995. The view combines images taken in violet, green and near-infrared filters in 1998 and 1995. The colors have been stretched to show the subtle differences in materials that cover the icy surface of Europa. Chemistryexperiments in the lab have mimicked the conditions on Jupiter's icy moonEuropa, providing new details about how molecules could react on the alienworld, scientists announced. The researchsuggests that water and sulfur dioxide ? the key ingredients in acid rain ? canreact quickly and easily on top of Europa's thick shield of ice and even inside it. Underneaththat ice, a liquid ocean is thought to exist. Scientists already knew that thecompounds can react in liquid form, but they needed the new experiment to learnthat the reaction also could take place on the surface of the Jovian satellite,where the temperatures are ?hundreds of degrees below freezing. "Thisis an extremely important result for understanding the chemistry and geology ofEuropa's icy crust," said Robert E. Johnson, an expert onradiation-induced chemistry on planets. Johnson, who is a professor ofengineering physics at the University of Virginia in Charlottesville, was notinvolved in the new research. MarkLoeffler, a scientist at NASA's Goddard Space Flight Center in Greenbelt, Md.,was the lead author of the study. "When people talk about chemistry onEuropa, they typically talk about reactions that are driven by radiation,"he said. 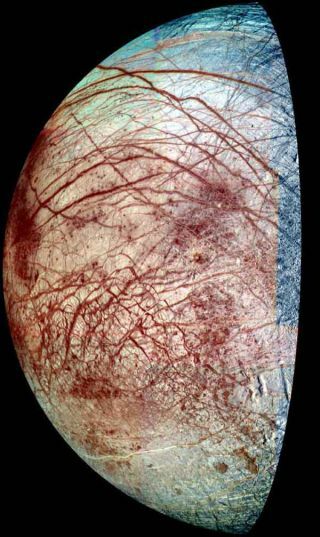 Since Europa'ssurface temperature hovers between minus 225 to minus 300 degrees Fahrenheit(minus 143 to minus 184 degrees Celsius), most chemical reactions need to befacilitated by an infusion of energy from radiation or light. On Europa,that energy typically comes from charged particles in belts of radiation onJupiter, formed by the planet's magnetic field. These particles can travel theroughly 417,000 miles (671,100 km) to the moon, but they penetrate just a fractionof an inch into its surface. Consequently, models of Europa's chemistry usuallystop there. "Onceyou get below Europa's surface, it's cold and solid, and younormally don't expect things to happen very fast under those conditions,"said Reggie Hudson, co-author of the study and the associate lab chief ofGoddard's Astrochemistry Laboratory. "But withthe chemistry we describe," Loeffler added, "you could have iceroughly 33 or 330 feet (10 or 100 meters) thick, and if it has sulfur dioxidemixed in, you're going to have a reaction." Remoteobservations have shown that sulfur is present in Europa's ice. The chemicalelement originates in the volcanoes of Io, another of Jupiter's moons, and themolecules become ionized and transported to Europa, where they can become embeddedin the ice. Additionalsulfur might come from the liquid ocean thought to lie beneath Europa's ice. Still,"the fate of the implanted or any subsurface sulfur is not understood anddepends on the geology and chemistry in the ice crusts," Johnson said. In theirstudy, the researchers simulated the conditions on Europa and experimented withspraying water vapor and sulfur dioxide gas onto quarter-sized mirrors in ahigh-vacuum chamber. The mirrorswere chilled to temperatures of about minus 280 to minus 370 degrees Fahrenheit(minus 173 to minus 223 degrees Celsius), and when sprayed, the gasesimmediately condensed as ice. Even in theform of ice, though, the concentrations of water and sulfur dioxide decreasedas they reacted to form different chemical products as well as charged ions. Loeffler andHudson found that in spite of the extremely cold temperatures, the molecules ofwater and sulfur dioxide reacted quickly in their icy forms. At about minus225 degrees Fahrenheit, which represents the warm end of the expectedtemperatures on Europa, the reaction was effectively instantaneous, Loefflersaid. At minus 280 degrees Fahrenheit, the reactions are completed after half aday to a day, he said. "Ifthat doesn't sound fast, remember that on geologic time scales ? billions ofyears ? a day is faster than the blink of an eye," Loeffler said. To test thereaction, the researchers added frozen carbon dioxide, also known as dry ice,which is commonly found on icy bodies, including Europa. "Iffrozen carbon dioxide had blocked the reaction, we wouldn't be nearly asinterested, because then the reaction probably wouldn't be relevant to Europa's chemistry," Hudson said. "It wouldbe a laboratory curiosity." But thereaction continued, making the findings significant not only for Europa but otherplaces where both water and sulfur dioxide are present ? including two more ofJupiter's moons, Ganymede and Callisto. Theresearchers also found that the chemical reaction produced an unexpectedly highyield, and that the charged ions that were produced will react with othermolecules. The discovery could blaze new trails for future chemical studies. "TheLoeffler and Hudson results show that really interesting acid-base reactionsare going on," said Robert Carlson, a senior research scientist at NASA'sJet Propulsion Laboratory in Pasadena, Calif., who collaborates with the tworesearchers but was not a co-author of the study. "I am anxious to seewhat might happen when other species are added and how the minor concentrationsof sulfur dioxide on the satellite surfaces affect the overall chemistry." Theresearchers hope futureobservations of Europa made by passing spacecraft can corroborate theirlaboratory findings. The resultsof the study were published in the Oct. 2 issue of the journal GeophysicalResearch Letters.